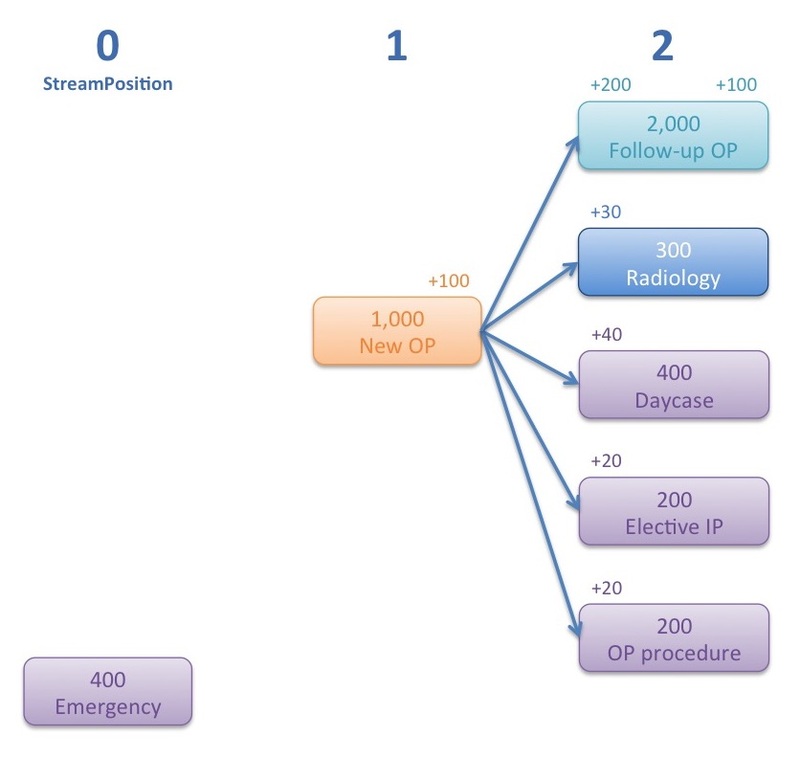 In this diagram the pathway begins with 1,000 new outpatients (shown in orange), and this activity has several direct consequences. Some of those new outpatients go on to have several follow-up outpatient appointments (demand for 2,000 appointments, in turquoise); in Scotland these are known as repeat or return appointments. Some have radiology diagnostics (demand of 300 patients, in blue). Some also go on to have surgery in various settings (purple). Separately, we have 400 emergency patients who stand alone because they don’t affect the pathway that begins in outpatients. Gooroo Planner automatically works out the conversion rates from the new outpatient activity to demand in the other settings of care. So from new to follow-up outpatients it’s 200 per cent (i.e. each new outpatient receives an average of two follow-up appointments ), to radiology it’s 30 per cent, and so on. Now let’s say that we are planning to see an extra 100 new outpatients, shown by the little number to the top right of the orange box. That’s a 10 per cent increase in new outpatient activity, and if conversion rates are steady then we would expect that to cause demand to increase by 10 per cent in all the other settings of care that are downstream. So we get extra demand for 200 follow-up appointments, 30 radiology appointments, etc as shown by the little numbers to the top left of each box. If you model this in Gooroo Planner, and set the scenario to keep the waiting lists a constant size, your activity and demand comes out like this – it’s the same numbers as in the diagram above. All very straightforward, and a good start to our modelling. But now let’s say we have a backlog in follow-up outpatients that we want to clear, and we need to see an extra 100 follow-up patients to do it. That’s shown by the number to the top right of the follow-ups box above. We know that, in real life, some of those extra follow-ups would go on to have surgery, causing yet more demand there. But our current model doesn’t factor that in. What can we do? 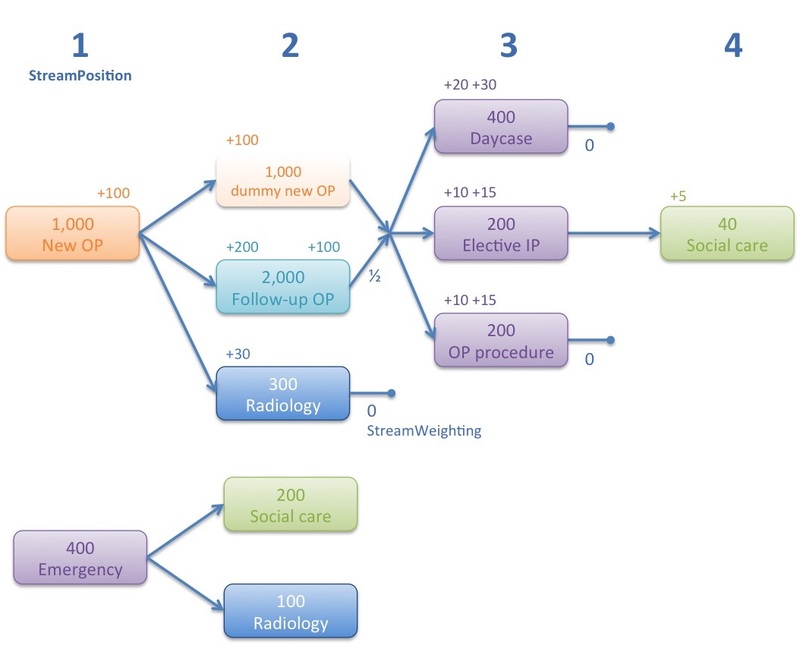 The diagram above shows how we can model the knock-on effects of extra follow-up outpatient activity. The trick to making this work is to have a dummy new outpatient service at stage 2 of the pathway, because then we can make all the patient flows work as intended. Our 1,000 new outpatients cause demand for 2,000 follow-ups and 300 radiology appointments as before. 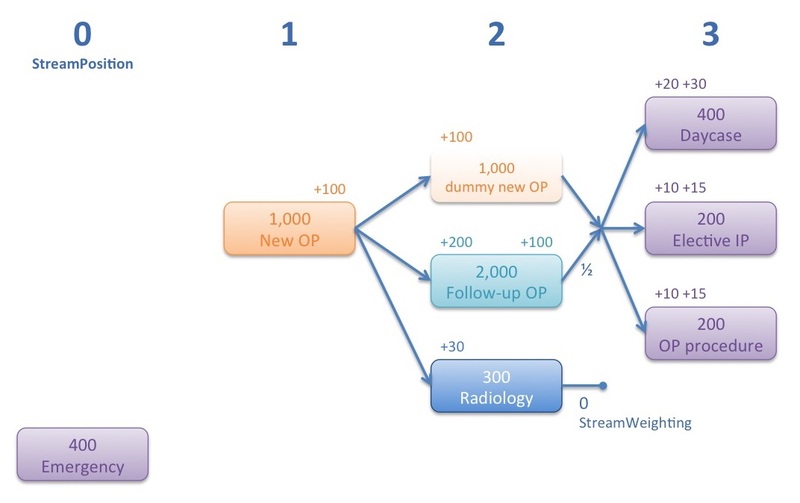 But now those new outpatients also (via the dummy service) combine with the follow-ups to create demand for surgery. The easiest way to follow this is to look at the effects of the extra patients we plan to see. The extra 100 new outpatients create extra demand for 200 follow-up and 30 radiology appointments as before (and the extra 100 new patients are repeated in the dummy new outpatient service). This extra demand is shown by the numbers to the top left of the boxes. Look at stage two of the pathway. If 1,000 new outpatients and 2,000 follow-ups convert to demand for 400 daycases, and if follow-ups convert at half the rate, then the conversion rate directly from new outpatients to daycases must be 20 per cent, and the conversion rate directly from follow-up outpatients to daycases must be 10 per cent. So if we see 100 extra new outpatients then the extra daycase demand will be 20, and if we see 300 extra follow-ups (200 arising from the 100 extra new outpatients, and then a further 100 in follow-up backlog clearance) then the extra daycase demand will be another 30, so the total increase in daycase demand will be 50. A similar logic applies to the other surgical settings of care. The sharp-eyed among you may have noticed that in the first example the conversion rate from new outpatients to daycases was 40 per cent, but now it is only 20 per cent. Why? In the first example we simplified the logic by saying to ourselves, “well, those daycases were all new outpatients once”; 40 per cent of those outpatients eventually ended up as daycases, even if some became follow-up outpatients along the way. In this second example we have changed the model to reflect more closely what happens in real life, so the conversion rates are now the direct ones. 20 per cent of new outpatients convert directly to become daycase demand, and the rest go via follow-up outpatients and may convert from there. Now that we understand how to model quite a complex pathway, we can extend our modelling into even more advanced situations. In this example we have added social care assessments downstream of each inpatient service, and a further radiology service downstream of emergencies. Once again you can track the effects of extra activity through the system. 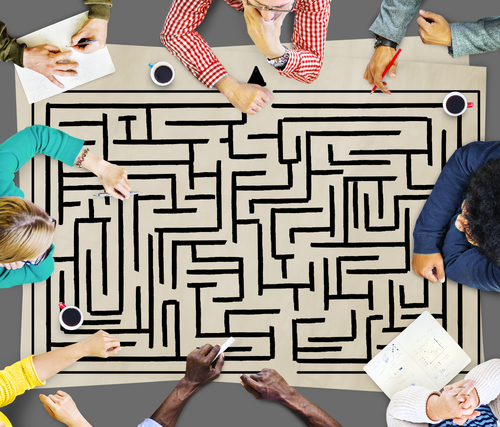 As always, if you need any help modelling your pathways then we are ready to help. Just email support@gooroo.co.uk. If you don’t yet have a licence to use Gooroo then please contact us at info@gooroo.co.uk to ask about setting one up.